Finding his range: Tommy Reilly was in fine form for Breaffy in their win over Ballintubber. If Breaffy are going to claim their first ever senior county title, they are certainly going to earn it. After topping a group that included fellow semi-finalists Knockmore, they saw off arguably the fourth best team in the county in Garrymore in their quarter-final win. On Sunday they backed that up with a steamrolling of the defending county champions Ballintubber to set up a final on the bank holiday weekend against fellow local rivals Castlebar Mitchels. This will be a repeat of the 2013 final between the sides, with a few little angles thrown into the mix. Castlebar Mitchels this year are managed by Declan O’Reilly who was in charge of Breaffy in the 2013 final, you’ve also got the Reilly brothers Tommy and Eoghan lining out against each other once more in the final and their father Tom whose a former Mitchels player is now part of the Breaffy management set up. But back to the football on the field. If one person dominated the game, it was Aidan O’Shea. The Breaffy man scored 2-1, was hauled down for a penalty and was sent to the line for a second yellow card late on in this game, it was a hectic 60 minutes for O’Shea. Ballintubber opened the scoring with Alan Plunkett firing over a point from long range inside the first minute of the game. Two minutes later though O’Shea landed his first real statement of intent, Keith Mulchrone picked out O’Shea who despite the best efforts of a number of Ballintubber defenders was able to hold off their challenges and get away a shot that rifled the back of the net from close range. Straight from the kick-out Breaffy won back possession and Tommy Reilly fed Gary Walsh and he slipped it over the bar. With six minutes gone on the clock, things got better for Breaffy. Seamus O’Shea and Matthew Ruane combined well and fed in Walsh, who took the unselfish option of passing the ball across the face of goal to the unmarked Reilly who palmed the ball to the net from close range. Damien Mulligan’s men couldn’t have dreamt of a better start. Reilly stretched his sides lead out to seven points when he slung over a point from a free, to leave the score at 2-2 to 0-1. Alan Dillon responded for Ballintubber with a point from out on the right, Dillon put in a serious shift for Ballintubber all day, always looking for the ball and trying to work space for his team. Cillian O’Connor pointed a free shortly after Dillons’s score as Ballitubber looked to work their way back into the game. Their probing of the Breaffy defence was met with a stiff rearguard action, with Colm Jordan staring in a sweeping role, closing off most avenues of attack. Breaffy’s defence were dealt a blow when Mayo senior panel member Michael Hall, had to go off injured on the quarter of an hour mark. 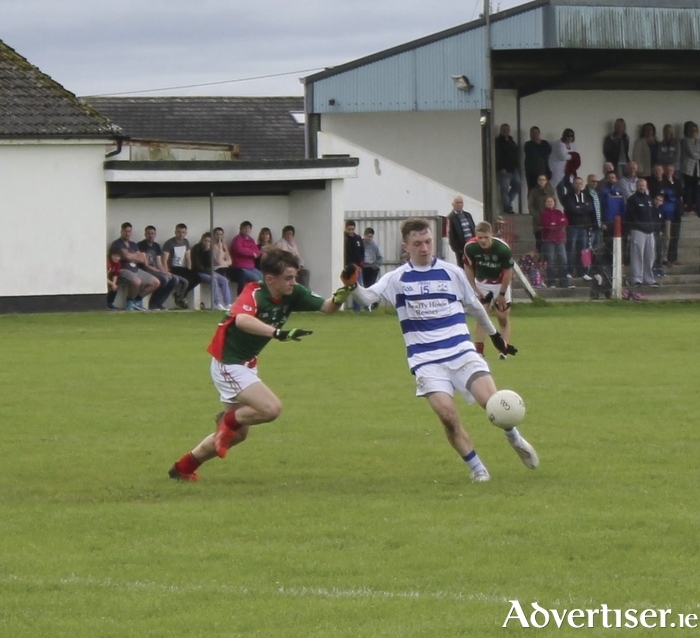 Hall had missed the quarter-final win over Garrymore and it flared up again on Sunday. Breaffy put an end to Ballintubber’s scoring run with two points in a minute when Reilly slotted over a wonderful point from play and Conor O’Shea nailed a free. Ballintubber tagged on three more scores before the break with Cillian O’Connor kicking all three points, two from frees and one from close range after being set up by his brother Ruaidhri. Which left the score at 2-4 to 0-6 at the short whistle. Ballintubber introduced Stephen Broderick at the break and the former Westport player had an immediate impact in the game, fielding a few balls and helping Ballintubber get the opening two scores of the half through another O’Connor free and a fine point from play for Michael Plunkett. Breaffy responded through a Matthew Ruane point to keep their noses in front by a nice distance. Eight minutes into the half, Damien McGing kicked Ballintubbers ninth point, but a minute later the outcome of the game was decided. Tommy Reilly drove a quick free into the danger area which Aidan O’Shea claimed and he was hauled to the ground as he looked to break for goal and the referee had no hesitation in awarding the spot kick. Micheal Jennings strolled up from his full back position to take the kick and dispatched it with ease to the back of the net. Three minutes later O’Shea once again got through on goal and this time there was no stopping him and he slammed it home for his sides fourth and his second goal of the game and with that Breaffy could start looking forward to the final. Ballintubber did rally late on and forced Robbie Hennelly into two outstanding saves one from Bryan Walsh and another when a 45’ dropped short and a fist got to the ball sending it goalwards, but Hennelly was alert to put it around the post. Ballintubber did get a goal late on when O’Connor fired through a mass of bodies on the line from a close range free, but it was only putting a gloss on the scoreboard. Breaffy march on to the final and will take some stopping if O’Shea can reach the same heights again. Breaffy: R Hennelly; C Jordan, M Jennings, D Morrin; R Martyn, C Kelly, M Hall; R Fadden, S O’Shea; C O’Shea, A O’Shea, M Ruane; K Mulchrone, G Walsh, T Reilly. Subs: D Cannon for M Hall, G Dunne for M Ruane, L Irwin for G Walsh, G Jennings for R Martyn, P Dravins. Ballintubber: B Walsh; G Loftus, C Hallinan, B Murphy; M Plunkett, D Geraghty, M Kelly; J Gibbons, R O’Connor; D O’Connor, A Plunkett, D Coleman; D McGing, C O’Connor, A Dillon. Subs: S Broderick for G Loftus, C Finnerty for A Plunkett, B Walsh for D McGing, S Finnerty for D Coleman, D Clarke for M Kelly.